Please sign with the Denver Broncos, Payton Manning. Put an end to this Tim Tebow joke once and for all. Not since people were trying to convince me that Milli Vanilli was the world's greatest musical act has a cruel joke needed to be exposed this badly. When I heard Denver fans yelling for Tebow to replace struggling quarterback Kyle Orton in one of Denver's early games I knew this was going to get interesting. Like most rational people, and almost everyone who had actually seen Tim Tebow throw a football, I thought he would start one game, scramble around like he was in a Benny Hill skit, then get his head handed to him by an angry linebacker. What did happen almost defies description. Tebow went on a streak of fourth quarter come-from-behind wins that even Jesus would be forced to admit were pretty good examples of miraculous comebacks. After the first couple you could sense the palpable expectation in the crowd's demeanor as the fourth quarter arrived. The left-for-dead Denver Broncos were quickly becoming a playoff contender and it seemed all due to miracle worker Tim Tebow. The nation was transfixed. Christians had a hero. Tebow couldn't fail. Hail Mary. Wait a minute, that's not right. I mean, thank you, Jeebus. And he didn't. When he handed the Chicago Bears what is the worst loss I ever remember as a Bears' fan in yet another fourth quarter comeback and subsequent overtime victory week 14 even the skeptics had to acknowledge maybe Tim Tebow was here to stay. The Broncos made the playoffs. They even won a playoff game against the Pittsburgh Steelers in the best NFL game Tim Tebow will ever play, maybe his only good one as a quarterback. The next week Tebow's season came to a crashing halt as the New England Patriots once again proved they don't have much patience for jokes like Tim Tebow. But this was only one setback in what his fans and now even many experts were predicting would be a steamroll into the Hall of Fame. Unfortunately, not everyone sees it that way. Chiefly, those who have the most to gain or lose from Tim Tebow's performance as an NFL quarterback: his coach and General Manager John Fox and John Elway. They don't seem to believe in Tebow at all, as evidenced by Elway's obsession with getting recently released Colts' quarterback Payton Manning to Denver to sell him on becoming the Broncos' quarterback for 2012. 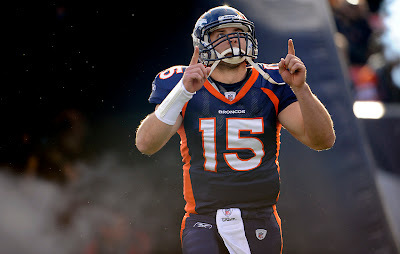 If Tebow is so good and so capable, why is Elway obsessed with getting Manning to the Broncos? That's a rhetorical question everyone but the football stupid and true believers already know the answer to. Tim Tebow is not a capable NFL quarterback. He's a future punchline. It was fun while it lasted, but now it's time for Tebow to go back to Florida, where he should have been drafted in the first place, and finish his career as a Tight End for the Jaguars. 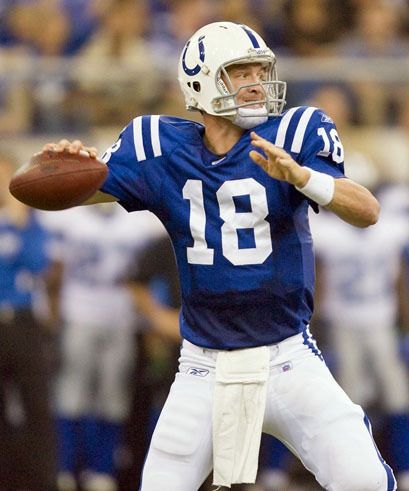 Save us, Payton Manning. You're our only hope. Update: There's no more reason to speculate about Tim Tebow's value as a quarterback, 31 directors of Player Personnel will now do that for us. We're about to find out exactly what NFL teams think Tebow is worth. he is a self-promoting fake christian, not a qb. I don't see any evidence that he's anything but sincere about his religion, so I didn't write about that, but I think he's a fake quarterback. That said, I think he can easily play Tight End or H back in the NFL. To address your first point: a whole lot of NFL players are just as devout as Tim Tebow and do great work for charity, too, but don't feel the need to alert the press every time they do. I don't think Tim alerted the press to anything. I think the press has put him under a microscope unlike any other professional athlete I've ever seen. I'm sure he wishes he could have a more normal football carreer where he doesn't have to win every single game. A carreer where they allow him to get better with experience like every other QB who has only started for one year. The whirlwind around him is simply about the need to build people up so we can tear them down. Its that simple. He may not be the best passing QB but he brings other things to the table as well. In general when he took care of the ball, and in most games he did, he was able to pull off wins. His running style helps his team get more first downs and also wears down defenses. Plus with low turn overs there are less freebies for the opposing team. It seems that the measure used to judge Tebow as a QB is much higher than that of other players. I can think of lots of QB's that weren't great in the beginning of their NFL career such as Steve Young, even John Elway. He may never be an elite QB, but hey there are only 2 or 3 of those guys at any time. Should all of the teams simply dump their QB's. I'd also point out that the playbook that Tebow had at Denver was very very thin. They only opened it up a bit in the Pittsburg game. I think given time, a real offseason to prepare, to work with the first string, etc... you would see an even better QB. And for all those dismal QB ratings he still got the job done in the clutch. Again rushing yards are valuable. Oh well. Only time will tell. I really think small market NFL teams without as much money should invest in alternative offensive systems. Running backs are extremely cheap right now and so are running QBs. In a league where more and more defenses are being designed to stop the pass it will eventually make weak against a real pound and ground offense. If you read your own article it turns out he made lemonade out of lemons in Denver. His coach and front office didn't believe in him. I'm sure players had doubts. The point is that with little preparation (no preseason) he was able to do very well under the circumstances. I can see why many people don't like him simply because of the hype. But Tebow didn't create the hype. The media did. I think its all about the story, tearing down people, and waiting for them to crack. It has become a pretty sick part of our culture these days. A team that has a chance of landing Peyton Manning would be crazy to not go after him. And I fully believe that Elway was scared to keep Tebow because he is not a traditional quarterback and Manning obviously is. The truth is that by picking up Manning, Elway gets out of a sticky situation of having to stick with Tebow and pretend that he likes him. I think in the end Denver will regret this move. Tebow is young with years of playing time ahead of him. Manning has two years in him at best if he stays healthy and then Denver has no quarterback. You are so correct, Peyton Manning is the past, and Tim Tebow is the future. John Elway was very shortsighted. I agree this was a godsend for Elway. I would be hard-pressed to argue that Tim Tebow is a bad person or even a bad football player. I do think he's a bad quarterback. New York will either be either the best or the worst thing that ever happened to him. I was hoping he would get his chance in Jacksonville. You still feel Tim Tebow is the future?